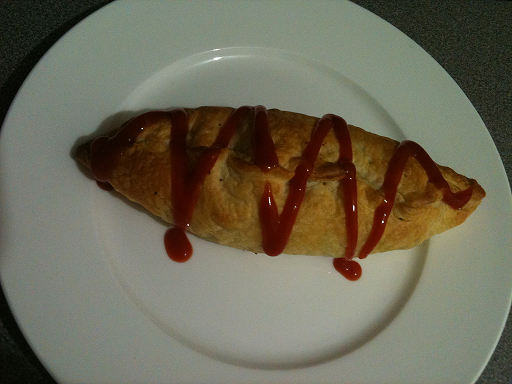 I haven't had a pastie in ages so went looking for a pasties recipe to satisfy my craving. 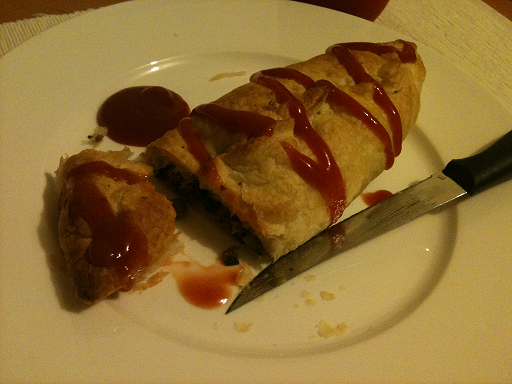 I was shopping at my local supermarket when I picked up one of the recipe pamphlets by Curtis Stone and found a delicious Beef and Vegetable Pasties Recipe. Of course I changed the pasties recipe around a little. I don't like corn so swapped it for peas and I got rid of the egg and swapped that for melted milk-free margarine. Note: Make sure you divide all the mixture between the four pastry sheets. You may think the pastry will not be able to take all the filling but it can. The pastry will stretch over and stay. Otherwise like me you can make five pasties. What I love about pasties is they are a meal in themselves. Just heat 'em up and eat. Wash one plate and then you can sit on the couch and relax! 2. Heat 1 tbsp oil in a large fry pan over high heat and sauté the beef for 5 minutes, breaking up any large clumps. Strain the beef and discard liquid from pan. Place the pan back on heat and add 1 teaspoon of oil. 3. Add the onion, garlic, and cook for 3 minutes. Add the carrot and potato to the pan and cook for an additional 3 minutes stirring often. 4. Return beef to the pan, add the peas, tomato and spinach and cook a further minute or until the spinach has wilted. Remove from heat and stir through the parsley, season to taste with salt and pepper and let cool for 7 minutes. 5. Lay the 4 rounds of pastry onto a clean work surface and divide the filling evenly between the centre of each round of pastry. Brush the edges of the pastry with the melted margarine and carefully fold and crimp the edges together to seal the pasties. Remove the plastic and poke several small holes with a knife in the pastry to allow steam to escape whilst cooking. 6. Place pasties onto a baking tray lined with baking paper, brush with a little of the melted margarine. 7. Bake for 18-20 minutes or until the pastry is golden brown and the filling is cooked through. 8. Let sit at room temperature for 5 minutes before serving. 9. Serving suggestion: for extra flavour, serve with tomato sauce. I went looking for a Ginger Biscuits Recipe as I went swimming with the dolphins a few weeks ago which I was very proud of myself for doing as I am terrified of deep water and while we were on the boat searching for dolphins to swim with we were handed ginger biscuits to eat. I don't think I have ever eaten ginger biscuits before but I took one bite and was hooked. They were delicious. So once I got home after having a sensational day of swimming with the dolphins :) I went searching for a Ginger Biscuits Recipe. The Ginger Biscuits Recipe I found was by Jamie Oliver as it was getting rave reviews. Always a good sign. Firstly it took me ages to convert everything from grams into cups. Then I removed the egg from the recipe and used raw sugar instead of demarara sugar as it was all I had. I also used honey instead of golden syrup as again honey is what I had. I found this recipe to be incredibly sweet after making in twice and reducing the sugar amounts considerably. I made them and they were incredibly sweet but also in credibly delicious. Please note the strength of the ginger depends on how long it's been in your cupboard and please make sure the cookies cool completely before you pop them in your biscuit container as they will go soft. These are incredibly delicious cookies. Every time I open the biscuit tin I get this wonderful sweet honey, ginger aroma float up into my nostrils and totally hypnotise me and demand I eat them all. You won't be able to stop eating at one you will definitely eat two at a time or more! You have been thoroughly warned hahaha. This recipe makes 12 biscuits of course if you want more cookies just double the recipe. 50gm Miracle margarine or any low lactose or lactose free margarine such as Nuttelex. 1. Pre-heat the oven to 160c gas mark 3 and line two baking sheets with grease proof paper or the reusable baking sheets. 2. Put the margarine, sugar and honey in a pan and bring up to heat melting the margarine and allowing the mixture to amalgamate. Allow to cool slightly. 3. Sift together all the other dry ingredients into a bowl. 4. Pour in the warm butter mixture and bring it all together. 5. At this point the mix should be holding its shape but it will be slightly brittle but don't worry as this creates the ridges and finished texture of the biscuit. 6. You can roll the mixture into balls about 1-2cms in diameter or you can just place heaped teaspoons on the baking tray. These biscuits really spread so leave a bit of room between each so they don't stick together. 7. Place in the oven for 10-15 minutes until they start to colour, they will be initially soft when removed but as they cool they will firm up nicely. 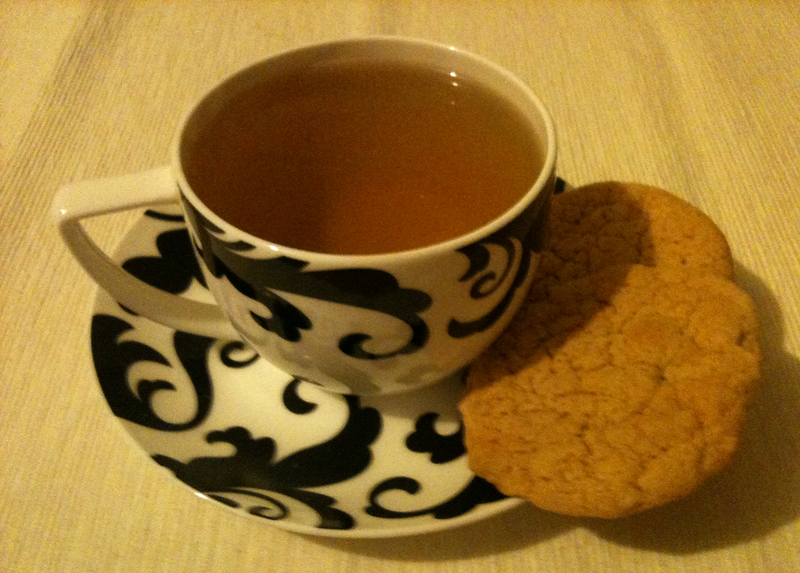 Perfect with a cup of Chamomile Tea! Please make sure the cookies cool completely before you pop them in your biscuit container as they will go soft if still warm.